MELBOURNE • English Premier League playmaker Aaron Mooy is set to return, as Australia chase a big win over Thailand today to qualify for next year's World Cup. The Huddersfield player was missing through illness as Australia crashed to a 2-0 defeat by Japan last week to leave their Russia 2018 Finals hopes hanging by a thread. The loss left Australia outside the two direct qualification places in Asia Group B but level on 16 points with Saudi Arabia and behind the already qualified Japan (20) heading into the final pool game. 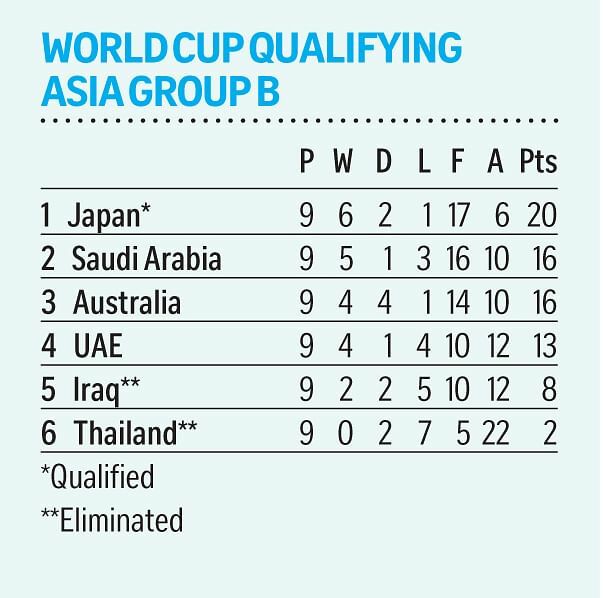 The Socceroos are behind the Saudis on goal difference (-2) and need to hammer the Thais in Melbourne in case the Saudis beat Japan in Jeddah later today. Depending on results, Australia or Saudi Arabia will have to face South Korea, Uzbekistan, Syria or China from Group A in an Asian eliminator before meeting the Concacaf play-off winner in the final showdown for a place in Russia. Under-pressure Australia coach Ange Postecoglou believes his side have the arsenal to beat the Thais comfortably and qualify automatically. "We have just got to play well," he said. "If you don't play well you leave things to chance, and we don't want to leave things to chance. TIM CAHILL, Australia forward, acknowledging that his team must score many goals to ensure they qualify and that they are capable of doing so. "We've got to make sure we stay focused and play our football, keeping it at a high tempo and pressuring the opposition from start to finish. When we do that, things tend to fall into place." Veteran forward Tim Cahill promised a "fearless" display against the Thais. "We all know what's on the line," said the 37-year-old. "I feel we're ready. "Goals will definitely come. I'm confident we'll score a lot of goals and I'm confident that we'll make a great account of ourselves." Mooy is the key midfield creator and crucial to Australia's attack, which was criticised as slow and unimaginative against Japan. Postecoglou said Mooy was ready to return along with tall striker Tomi Juric, who started on the bench against the Japanese. "They are fine, they had a run on the weekend," he said. Thailand are bottom of the group - with two points from their nine games - but Australia needed two Mile Jedinak penalties to force a 2-2 draw in Bangkok last November. Thailand coach Milovan Rajevac has dashed Australian World Cup dreams before and could do so again. The Serb was in charge of Ghana in 2010 when a 1-1 draw virtually ended Australia's hopes of a place in the knockout stage. Thailand can cause problems especially if Chanathip Songkrasin sees enough of the ball. The playmaker's display against Australia last year showed that he was not all tricks and twists but could make a difference in a big-game situation. Closely marked by Iraq last Thursday, he did not have the impact he would have wanted in the 1-2 loss. He should get, and enjoy, a little more space in Melbourne, and that means more chances for striker Teerasil Dangda, who scored twice against Australia in Bangkok. In Jeddah, Japan's players had to scramble to training in taxis ahead of their qualifier against Saudi Arabia after their team bus failed to show up at their hotel. Japan goalkeeper Eiji Kawashima said his team remained focused despite the snag. "It was an enjoyable trip and there's nothing wrong with experiencing (something like that) for the first time," he said. "There is no point in getting stressed out about it. We just have to keep our focus on the task at hand."